If you haven’t tried hard water fishing, northern Manitoba makes for an incredible introduction, with opportunity to reel in giant lake trout and pike. In Thompson, guided ice fishing packages are led by Akamihk Adventures. Wekusko Falls Lodge offers ice fishing vacations, with staff to prepare your catch of the day. In Flin Flon, Bakers Narrows Lodge is the place to go for excursions to wilderness lakes in the winter months. Clearwater Lake near The Pas is considered to be especially good for burbot, whitefish and northern pike. With hundreds of kilometers of groomed trails, it’s clear that northern Manitoba is paradise for snowmobile fanatics. The sport is a popular one in Thompson, where visitors can rent snowmobiles or bring their own on a private tour with a local. George offers Guided Snowmobile Tours on a volunteer basis – and it’s as easy as sending him an email to get things set up. 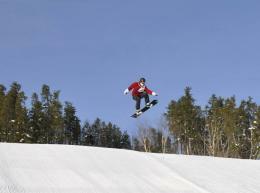 Sasagui Rapids Lodge provides a fleet of six rental ski-doos with long tracks for deep powder. The groomed trail starts right at the lodge, making it perfect for families who want an effortless route. A snowmobile trail map for the area can be found here and is an excellent reference for anyone looking to spend the day on a sled. The trail through Pisew Falls Provincial Park and to Thompson comes highly recommended. If you find yourself in The Pas with the itch to head out on snowmobile, the Kelsey Trail Sno Riders provide the best information on local events and trail maps, with one of the most picturesque routes taking sledders around Clearwater Lake Provincial Park. The Border Explorers Snowmobile Club is responsible for maintaining trails in Flin Flon, where you can cruise through mixed forest, swamp and across a variety of lakes. There are two groomed trails that loop from Flin Flon, passing Bakers Narrows and heading through to Saskatchewan. If you want to see a new town, follow the groomed trail to The Pas (100 miles) or Snow Lake (80 miles) where food and fuel are available at a few points on the trail. Whether you like to race down a ski hill or stay firmly on the ground, skiing is a popular pastime in northern Manitoba. 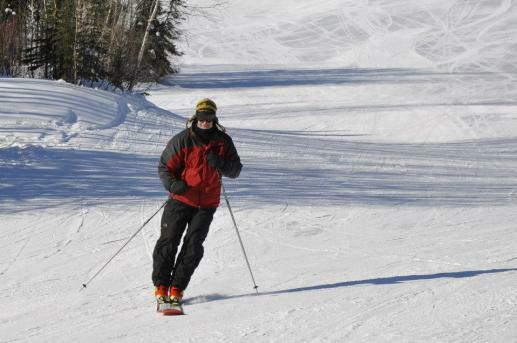 The Flin Flon Ski Club has 27 kilometres of cross-country skiing trails (Race Loop, Carlisle Loop, Boundary Trail and Valley Loop), with difficulty levels that range from easy to challenging. Cross-country ski enthusiasts can get their fix in Thompson on the Jack Crolly Cross Country Ski Trail, located along Highway 6 (across from Popeyes restaurant) and in The Pas along the trail in Clearwater Provincial Park. The Mystery Mountain Winter Park, located 22 kilometers north of Thompson, offers something a tad more exciting for thrill seekers. In addition to 25 kilometers of cross-country ski trails, the winter park also features 18 ski runs, a half-pipe and a tobogganing area. In stark contrast to the excitement of skiing, sledding and ice fishing – the scenery of Manitoba’s north is quiet, untouched and enchanting. Paint Lake Provincial Park has all the fixings of a fun day outside – with a toboggan hill, outdoor skating rink and plenty of trails – but it is also a beautiful park to simply sit back and enjoy. Pisew Falls Provincial Park (south of Thompson) is a must-see, boasting observation platforms where wanderers can enjoy the views of the powerful natural waterfalls. A 22 kilometer hiking trail takes you over the Rotary Bridge to Kwasitchewan Falls, which happen to be Manitoba’s highest. Thompson Lodge offers tours to the area if you don’t want to embark on the adventure solo. Wekusko Falls Provincial Park is home to a number of falls and rapids; the result of the plunging Grass River. Of course, a trip to Manitoba’s north wouldn’t be complete without staying up for the late-night northern lights show. Under ideal conditions, the Aurora Borealis comes out to play in the dark winter months, filling the sky with vibrant shades of magenta, green and red.